Last month, Britain’s Campaign Against Climate Change (CACC) was instructed to hire a private security company to monitor its Time to Act demonstration scheduled for early March. The request came as Scotland Yard refused to oversee the temporary closure of streets along the group’s agreed route through central London. The Met’s government-backed demand provoked outrage, as campaigners, politicians and trade unionists warned the move signaled the privatization of citizens’ right to protest. Others feared the demonstration would simply not go ahead. However, intense lobbying by human rights group Liberty, the CACC and campaigners nationwide has forced Scotland Yard to make a U-turn and back down. The body confirmed Friday it will take measures to facilitate CACC's protest on March 7. CACC said it is relieved by the news, and hugely grateful for the support it has received in recent weeks. It said, however, that Scotland Yard’s policy change caused it undue stress. She added that CACC also hopes the future fate of Britons’ right to protest remains intact. Liberty’s legal director, James Welch, who supported CACC in challenging the Met’s demand, said UK authorities should never have forced CACC to jump through such a series of futile hoops. “When the public wish to exercise their fundamental right to protest, police, councils and traffic authorities should be saying ‘let’s make it happen’ – not asking ‘how can we do as little as possible?’” he said. Earlier this month, campaigners launched an Avaaz petition calling upon the Metropolitan Police Service to preserve the right to protest. The petition demanded that police stop the privatization of protesting by ensuring public resources were made available to monitor and manage road closures and public safety during demonstrations. It has attracted 61,970 signatures to date. 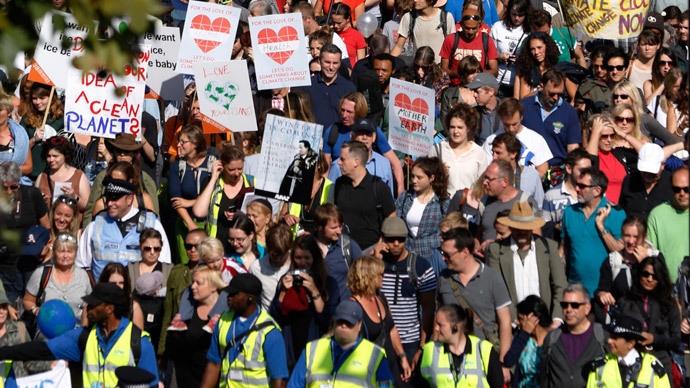 Campaigners say the proposal breaches international human rights standards, in particular article 11 of the Human Rights Act, which stipulates that all people have the right to peaceful assembly. Despite CACC’s temporary victory, the future of free British protest remains uncertain. In a formal statement, Scotland Yard said protesters’ right to police assistance at future protests is still in doubt. The Met said budgetary constraints had prompted its decision to cease its facilitation of protests.